Panda Fowler is a good-natured tax preparer who loves her wife Mitzi, their cat Brutus, their friends, and her routine. She’s a born skeptic who’s practical and down to earth. Mitzi Fowler is a free-spirited travel agent who keeps Panda from being a total stick in the mud. She believes in fun and fantasy and isn’t shy about her love of adventure or her belief in the possibility of magic and supernatural beings. 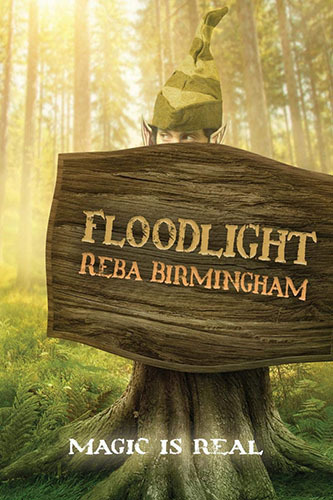 One of their best friends, curator of the Merryville Museum, brings internationally-acclaimed Fiona Castlebaum to unleash a performance piece called Floodlight. But when Fiona goes off script, Mitzi and Panda have their lives turned upside down. And then a creature from the Hercynian Forest arrives with a cryptic message for Panda. Worst of all, Mitzi goes missing. Will Panda have the courage to face a frightening world that she never believed in so she can find and retrieve her mate? Will Mitzi survive the ordeals she encounters? The suspense gradually increases, but so does the humor as Panda and friends challenge the magical world, battle powerful villains, and struggle to get Mitzi back.